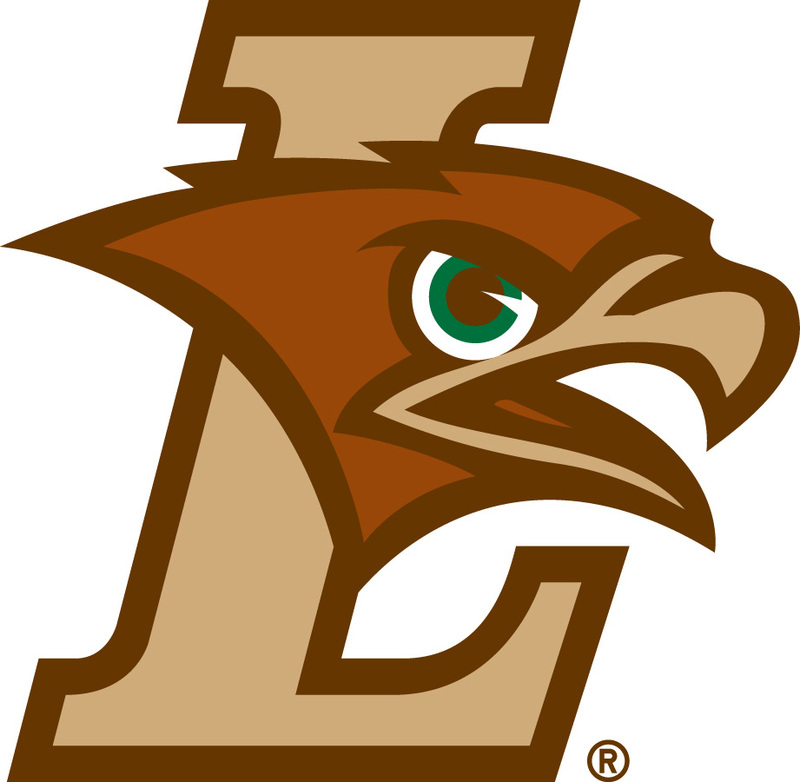 Before we get into the festive fare, like to give a big congrats to the Lehigh Mountain Hawks for the thrilling upset Friday night. Super proud of my alma mater!!! They put up a good fight against Xavier last night but sadly luck was not on their side and the shots just wouldn't sink. St. Patrick's day was spent as it should be in the Talbot household, with a black and tan, corned beef and cabbage soup and a decadent Guinness chocolate cake with Bailey's cream cheese frosting. 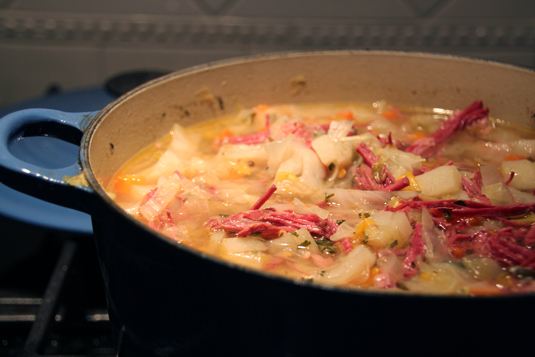 The soup was festive and tasty but a bit on the bland side; I found the healthy recipe here. The cake, however, made up for the lackluster soup. 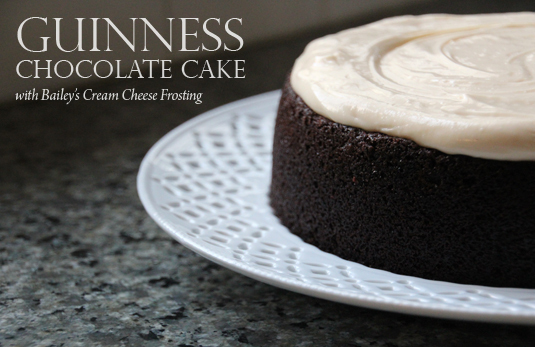 Looking like a frothy pint of Guinness, this chocolate stout cake was given an extra Irish touch by my addition of 8 teaspoons of Bailey's Irish Cream to the frosting in place of the 1/2 cup heavy cream. Thanks Nigella Lawson for the delicious recipe! Happy St. Patrick's Day! It's been 6 years since I've been in Ireland (too long). I studied abroad their my Spring semester of College, where I attended University College Dublin. Up to this point in my life it has been the most amazing experience, and the most overall educational (thanks Mom & Dad). Ireland taught me to become independent, to appreciate different cultures, how to travel, about the amazing history of Ireland (really puts in perspective how young America, or as they would say "The States", truly is) and how to appreciate beer (great beer). It's a time in my life I will never forget. Today I'll be raising my Jameson and Guinness to a great country... Ireland. Newgrange, an ancient passage tomb. The very popular Cliffs of Moher. St. Stephen's Green, park in the middle of Dublin. As you can see very pretty in the Spring. There is a shopping center right beyond the arch called St. Stephen's Green. Grafton Street is THE place to shop in Dublin. It's a long cobble stone street. The Spire of Dublin on Henry Street. You can't miss it. This picture is cut off but it is super tall. Messrs Maguire is my favorite pub in Dublin. It's still very old and laid back. Not a club like others have become in the area. Had to throw this one in... Malahide Castle home to the Talbot family. Saint Patrick's Day parade float in Dublin. Pretty creepy floats. The Liffey Bridge formally known as the Ha'penny Bridge. Caught this stunning commercial last night during The Good Wife. Prettiest 4 minutes I've ever seen on TV. Gorgeous. The powers of imagination never cease to amaze. You can read more about the spot here. Yes, it tastes as good as is it sounds. The main ingredients say it all: CHOCOLATE, STOUT BEER, and BREAD... these are a few of my favorite things. Did I mention this is a Chuck Hughes recipe? 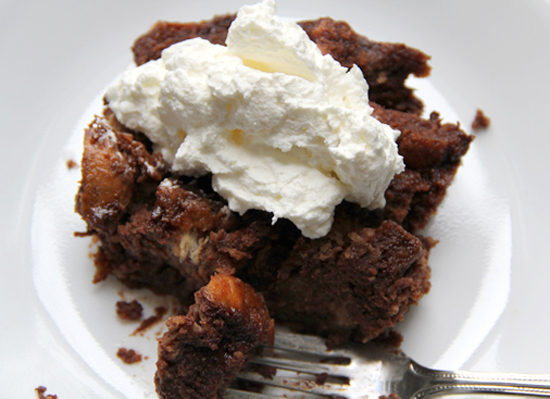 It is super simple and a great comfort dessert. Let me try to describe this dish as best I can: the bread adds sponginess to the texture of the dish; the chocolate has a custard-like consistency and absorbs into the bread, yet the extra chocolate mixture turns into custard around the bread; and the stout is very present, adding notes of coffee and alcohol, which enhances the chocolate flavor. 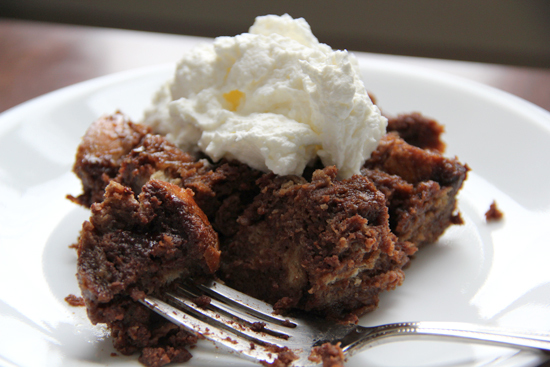 This is essentially a bread pudding; but, Chuck can call it a cake if he wants, he's the boss. 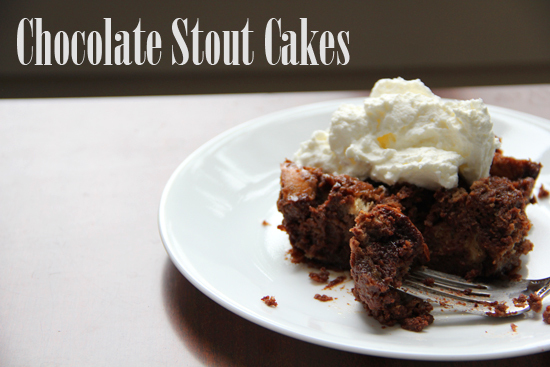 The Chocolate Stout Cakes are served warm with whipped cream. I personally enjoyed it best when it was closer to room temperature or cold (I'm weird like that, not always a fan of warm/hot desserts). I was 2 for 2 this weekend with recipes. As Matt would say, "I knocked it out of the park." Now I need to go to the gym. There is nothing like a ball of fried dough. Whether it be sweet or savory, it is always sinfully delicious. This weekend, when our plans fell through, I decided to take that extra time and try some new recipes I had been eying for awhile. The first being Shrimp Fritters from the ever so popular blog spoon fork bacon. The recipe was as good as I had imagined. The fritters were light and flavorful with a light golden, crispy exterior and a perfectly cooked doughy center. The dipping sauce of honey and chili was a fitting accompaniment to the fritter. A great combo of sweet and spicy. 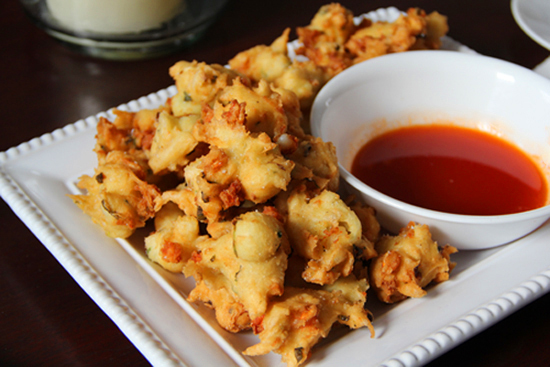 The fritters weren't the easiest thing I've every made, however, anything that's really good never is. For the recipe I used a food processor (the recipe says to use a stand mixer with a paddle attachment, which I do not have) to mix the dough which was extremely sticky! It stuck to EVERYTHING. Needless to say cleaning wasn't that fun but completely worth it. I did add a couple of extra green onions to the recipe and used pre-cooked shrimp. The shrimp was present in the fritters, but probably would have been even more so if I had used raw shrimp. I also used canola oil instead of the vegetable oil the recipe calls for to fry the dough. I think I got the same results, but used a healthier oil. At the end of the day I would definitely make this recipe again. 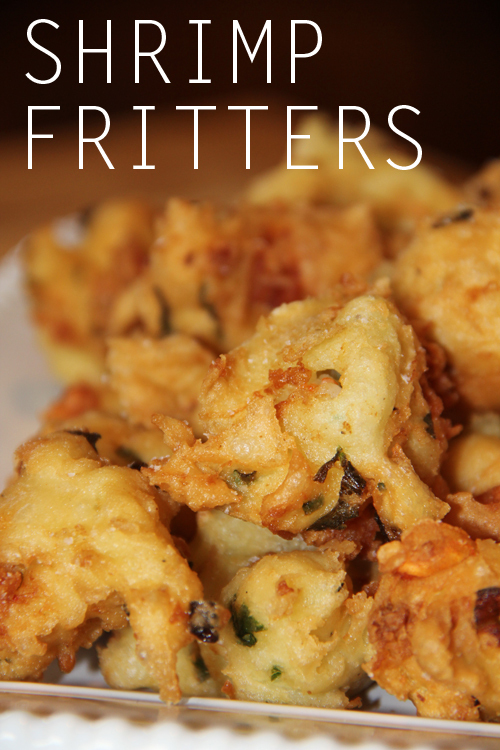 The fritters remind me of the Bag of Donuts appetizer from The Moorings in Newport, RI, one of our favorite spots to dine in the summer when visiting that area.